The Democratic Party dates back to 1828, when Andrew Jackson became its first presidential nominee; he won two terms. Hillary Clinton is the party’s 48th nominee. At nearly 69 years old, she is also its oldest. Twenty-eight years later, the Republicans kicked things off with 43-year-old John Frémont (1856). Frémont lost to James Buchanan in the very first Republican-Democrat presidential election, but he holds the distinction of being the second youngest GOP candidate in history (and the only major candidate with an accent in his name). ​Clinton is 1.7 standard deviations above the mean (56.4 years) for the 124 candidates in our larger sample. Democratic candidates are slightly younger on average (54.3 years), so Clinton’s outlier status is more pronounced among her party peers (2.1 standard deviations). Trump stands at 1.8 standard deviations among the 124-candidate mean and 1.7 standard deviations above the Republican mean (56.7 years). Democrats’ reputation as the party of the young and Republicans’ reputation as the party of the old are reflected in their candidates. The average GOP nominee is about 2.5 years older than the average Democrat. 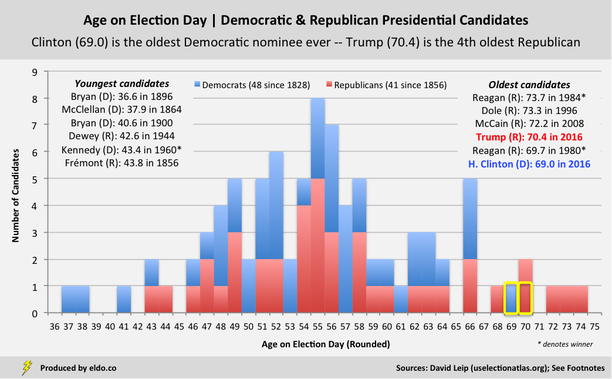 Six of the seven oldest major party candidates are Republicans, while four of the five youngest are Democrats. ​As a 69-year-old woman (on Election Day), Clinton can expect to live to 86.6, meaning she is 80% of the way through her projected life. Measured this way, Clinton falls from first to 11th oldest among 48 Democrats, and seventh to 41st among the 124 candidates in history with 10% or more of the popular vote. She barely cracks the top third of the broader group and is only about half a standard deviation above its average (75.7%). Men generally don't live as long as women, and as such, Trump doesn’t fall quite as far as Clinton when we adjust for life expectancy. At 70 years old, Trump can expect to live to 84.5, meaning his life projects to be 83% complete. That bumps him from fourth oldest to seventh among Republicans, and fourth to 23rd among the 124 candidates with ten-plus percent of the popular vote – about one standard deviation above average. Were he to win, Trump would be the tenth “oldest” of 58 elected commanders-in-chief, in similar company as Dwight Eisenhower in 1956 (66.1, 84%), Harry Truman in 1948 (64.5, 83%), and FDR in 1944 (62.8, 82%). Hillary Clinton and Donald Trump are old candidates, but where they are in life is fairly typical for presidential candidates. 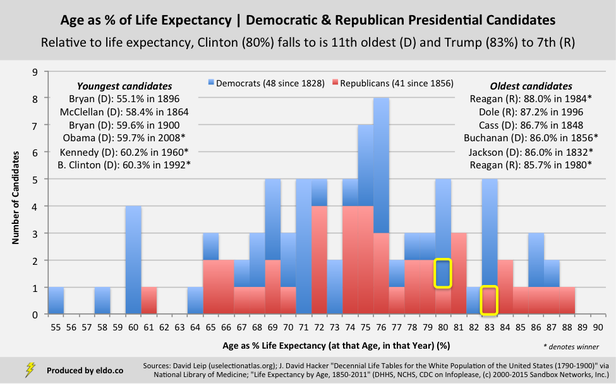 ​In Appendix II, we’ll leave you with the oldest and youngest candidates in history according to our “election-day age as a percentage of life expectancy” metric, highlighting a few notables and Clinton and Trump. ​ Hillary Clinton turns 69 years old on October 26, about two weeks before Election Day. Gary Johnson currently projects to win 6.6% of the popular vote, which may very well change. For now he is excluded. The National Archives and Records Administration lists no official record of the popular vote until 1824. For purposes of this analysis, we applied common historical convention and incorporated two major candidates from 1796 through 1820 and one major candidate in 1788-89 and 1792 (George Washington) into our analysis. "Elected presidents" excludes those vice presidents who assumed the presidency due to the death or resignation of the president.